Because System Wide Changes are permanent and affect all computers, they have been placed within the Options menu in a manner that keeps them from being accidentally altered. Watch the video or follow the steps below to learn how to make changes to your Lights. Click Menu and then select Preferences and then Options. 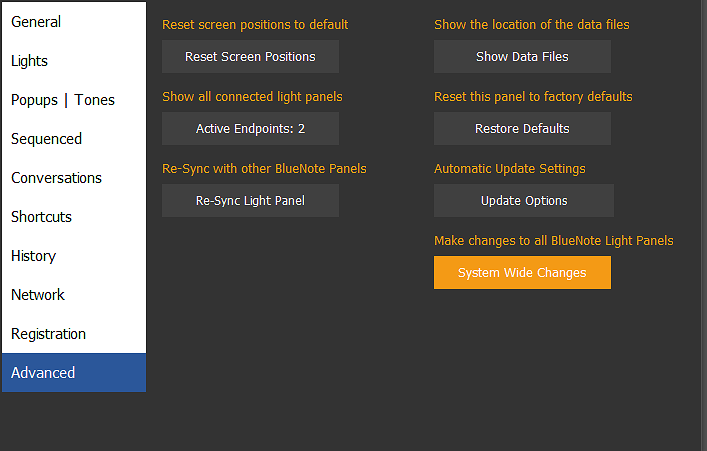 Select the Advanced tab and then click the orange System Wide Changes button. 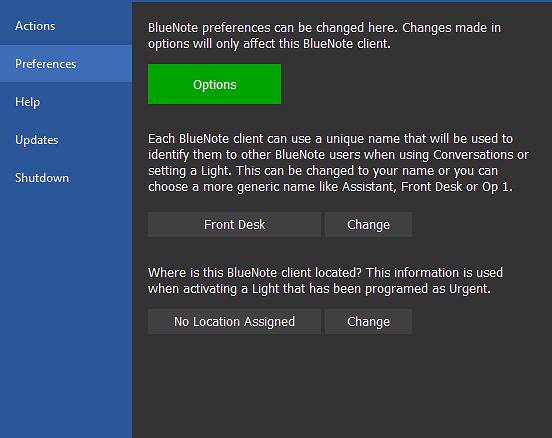 Since any BlueNote client can make changes we are confirming the user understands that these changes will affect all computers. 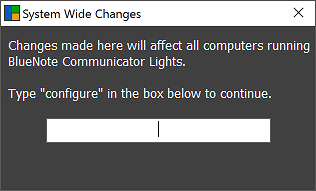 If you are wanting to add, change or delete Lights, then select Lights Panels. Each Light Panel can have up to 30 Lights for a total capacity of 120 Lights per system. Click on the Light you want to add, change or delete. Add or edit the Light text, select a tone and choose a color for the light. You can see what the Light will look like as you're programming it at the top of that Light's editor. Normal - Recommended setting - the light will activate the tone and popup a single time. High Alert - will re-alert every minute. Urgent - the light will re-alert every 15 seconds. • Immediate means that the Light will activate with a single click. Choose an optional Tone and a Color with the black drop-down arrows beside each of these options. You can "stack" BlueNotes within any Light. If you have BlueNote tabs programmed and you want this Light to display up to four BlueNote sub-menus, select those tabs by highlighting the name of the BlueNote tab in Green. 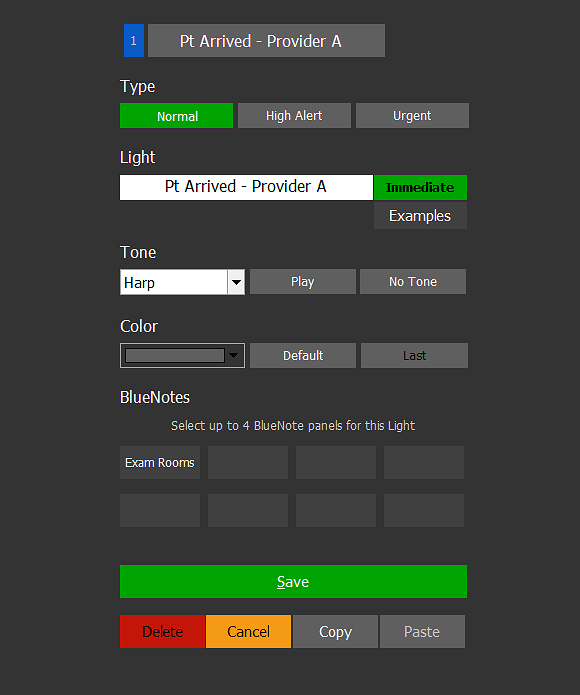 The example below displays only the unselected default "Exam Rooms" BlueNote tab (or panel). The white box under "Light" is where you'll change the Light Name. 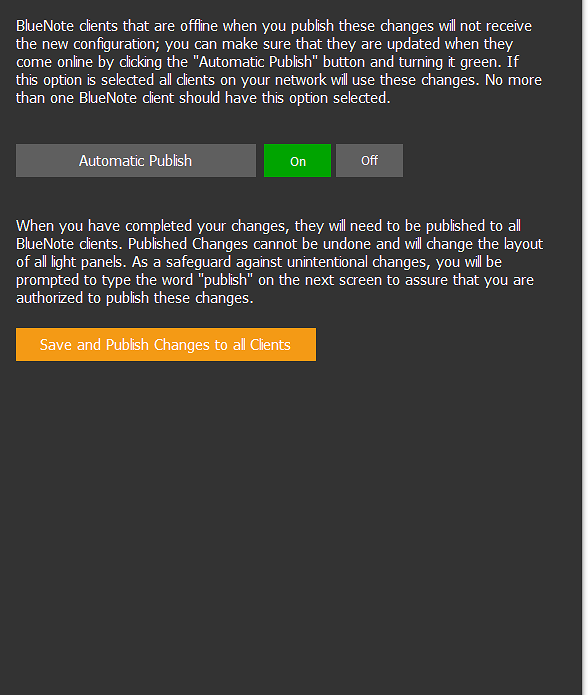 Tip: If you want to keep all BlueNote clients updated with any changes you may make, turn on Automatic Publish at the top of the publish screen. If this option is selected then this client will need to be online any time changes are published. You will only need to set one client for Automatic Publish. 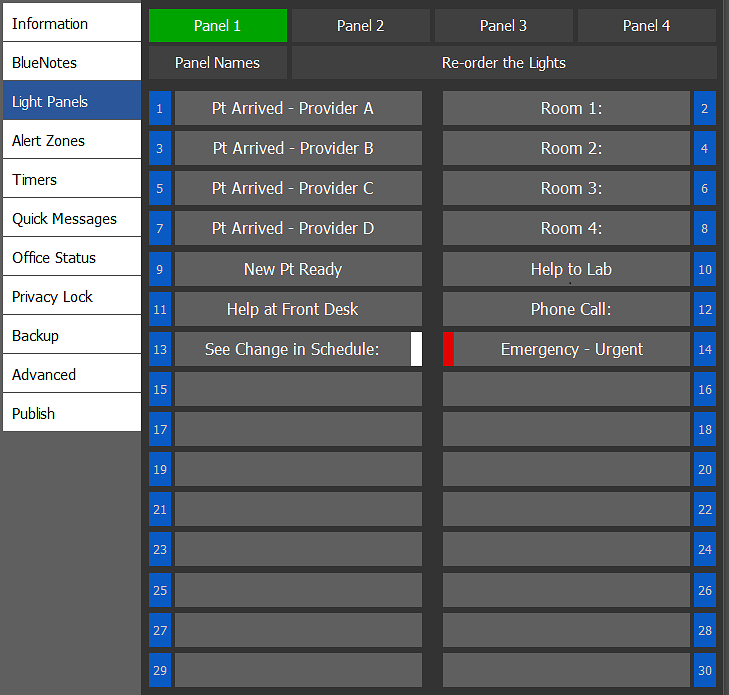 How can Alert Zones be programmed for providers who work in different rooms each day? How do I program and use Office Status?